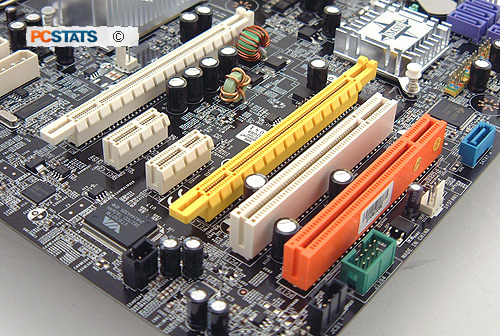 Looking at the bottom right hand corner of the MSI P965 Platinum we find seven Serial ATA II ports along with the USB headers and front panel I/O connectors. RAID comes care of the Intel ICH8R southbridge chipset. The JMicron IDE and SATA II ports can also support RAID 1/0/JBOD between themselves. MSI places the two physical PCI Express x16 slots far apart from each other which is good. 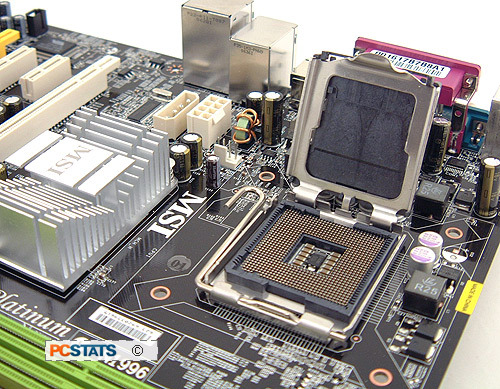 If you are to run two videocards, the MSI P965 Platinum motherboard allocates 16 PCI Express lanes to the primary videocard, 4 PCI Express lanes to the secondary, and disables the two PCI Express x1 slots entirely. PCI bus mastering devices go in the orange slot first. When installing up to 8GB DDR2 memory, remember that the colours represent one memory channel, not which slots to occupy with one pair of memory. To enable dual channel memory support, you'll need identical pairs, one in green and one in orange. 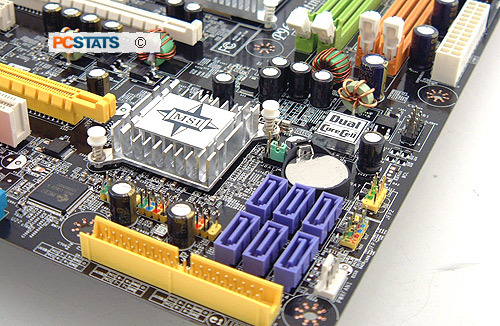 The MSI P965 Platinum motherboard is compatible with legacy 20 pin ATX power supplies, but it's recommended to use at least a 400W PSU which has a 24-pin power connector. 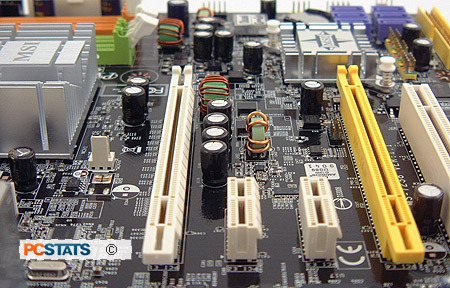 There is plenty of space around the Socket 775 so you can install larger after market heatsinks if you choose to. That's good news for overclockers who like to use water or phase change cooling rigs, and for low noise enthusiasts too. The passively cooled Intel P965 Express Northbridge generates a fair amount of heat, so maintain good airflow in the chassis and all will be fine. There's lots of space between the two PCI Express x16 slots (againk one is PCIe x16, the other PCIe x4) which is good for keeping temperatures at a minimum. 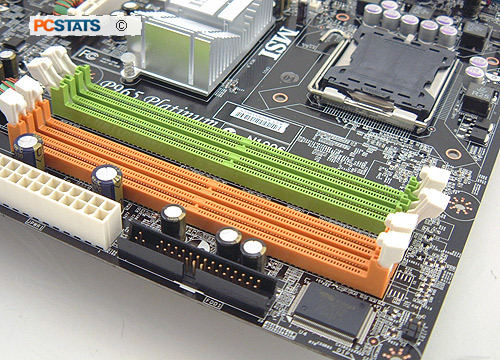 There is one three pin fan header connector just above the first PCI Express x16 slot, good if you're using after market videocard cooling or decide to swap out the Northbridge heatsink with an active cooler.